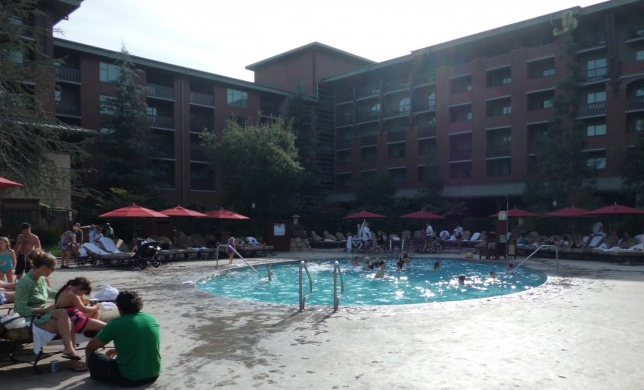 This is part 1 of a 3-part series on the Hotel Pools of Disneyland. Stay tuned for parts 2 and 3. 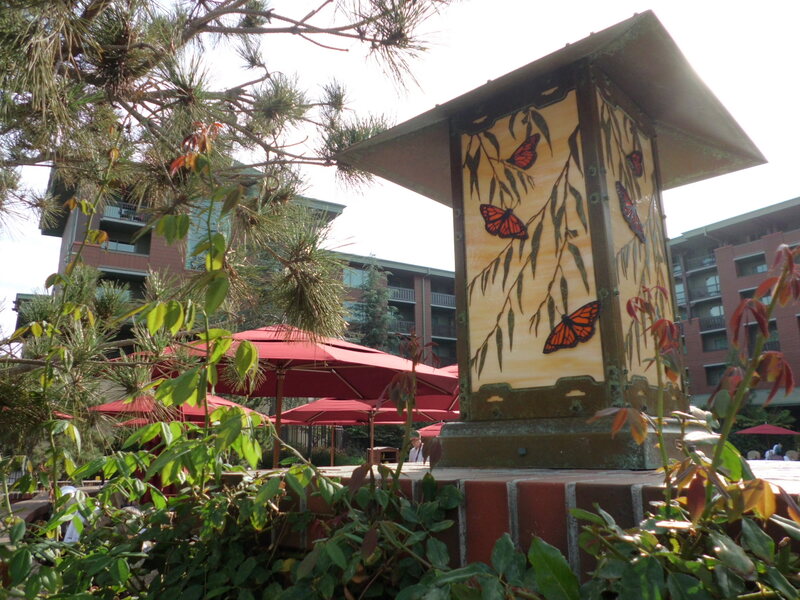 The Grand California is my personal favorite hotel at Disneyland. I love the mountain lodge aesthetic of the property. Walking through the lobby—with its huge fireplace, craftsman style furniture and light streaming through the high windows—can actually take my breath away. And the location, in the middle of both Downtown Disney and California Adventure makes me feel like I’m actually staying inside Disneyland. We once had a room with a balcony that overlooked the park—watching parts of World of Color from our room was definitely magical. 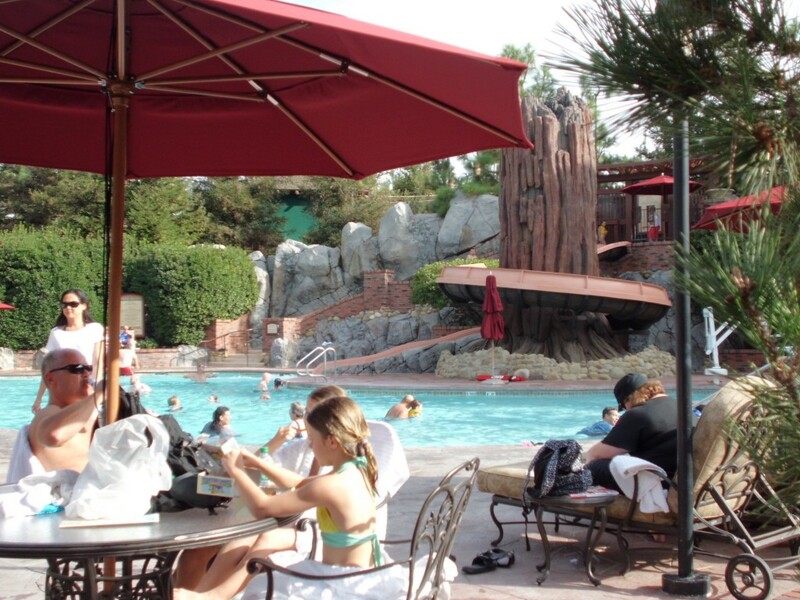 When we have stayed at the Grand California, one of the things we loved was going back and forth between the two parks and the pool, several times a single day. The pools definitely follow the lodge feel. There are 3, with 2 medium-sized Jaquizzis. There’s a cabana area and in the Redwood pool, a tree-themed waterslide. It’s not a huge water slide, but it does the trick and can keep the kids happy for a good hour or two. There’s also a foot deep Mickey pool for the really little ones, and the more traditional Fountain Pool. They reserve the Fountain pool for lap swimmers-only early in the morning. But Disney pools are often empty or close to it, early in the day. In the afternoon (when most of these photos were taken) the pools are completely swamped. Great minds think alike and of course all of the families seek their afternoon swim break from the parks, starting at around 2pm. Scoring a chaise, let alone two or three, is as rare as a short line at Space Mountain, starting from around 1:30pm on weekends and holidays. All of the Disney pools are hella-kid friendly, no-duh, with swim diapers available as well as life jackets, and always, always, lifeguards on duty. 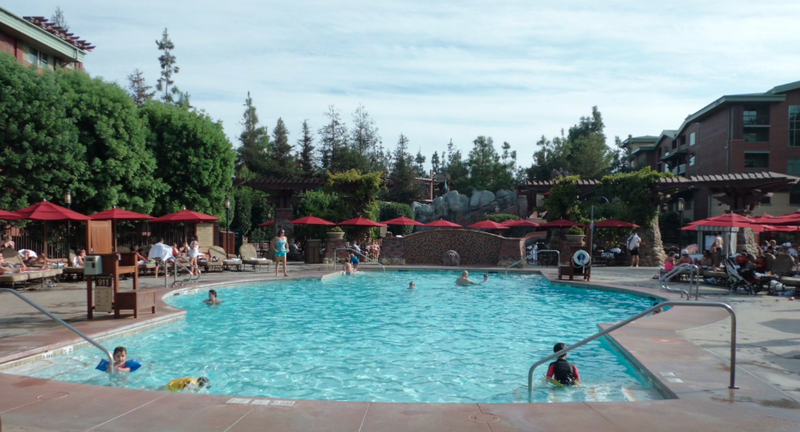 The Grand California is definitely a family-factory, but when I’m there, I find that the Yosemite-inspired details and the lodge vibe make me feel less like I’m in the middle of some juice box-fueled temper tantrum and more like I’m actually relaxing by a pool. The area is surrounded by the hotel buildings so that even though you’re in the middle of it all, it still feels shady, secluded, separate. It’s like Disney-lite with just the slightest twist of glamour. For more Southern California hotel pool reviews, click here.